When the temperature rises, easy meal prep and even easier clean up is my kind of meal! 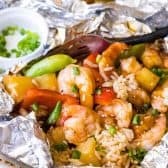 Teriyaki Shrimp Foil Packets taste light and fresh! Tender crisp veggies, succulent shrimp all served on a bed of rice for a complete meal ready in minutes, truly a dream come true! Preheat grill to medium high heat (425 degrees F). Prepare 4 sheets (12 x 18 inch) of heavy-duty foil and spray with cooking spray. In a large bowl, combine the pineapple, red and green peppers, sugar snap peas, garlic, ginger and 1 cup teriyaki sauce. Toss to coat evenly. On each foil sheet divide evenly (in order) rice, vegetable mixture and shrimp. Drizzle with olive oil, season with salt and pepper and finally drizzle with the remaining 1/2 cup teriyaki sauce. Seal each foil packet well and place on hot grill shrimp side down. Cook 5 minutes, flip over and cook rice side down for an additional 4 minutes. Remove from grill and allow to rest for 2-3 minutes before serving. Carefully fold back foil and garnish with green onions and sesame seeds. Drizzle with additional teriyaki sauce if desired. Be sure to choose a teriyaki sauce that is thick. Ready to serve rice produces the best results in this recipe. If you are using homemade rice, ensure it is cold when adding to the packets or serve the rice on the side cooking just the vegetables and shrimp as directed.